Artificial intelligence (AI) is changing the entire business landscape and companies implementing AI solutions are recognising operational efficiencies across the organisation, including within their customer service departments. In Calabrio’s latest research report, Are You Listening? 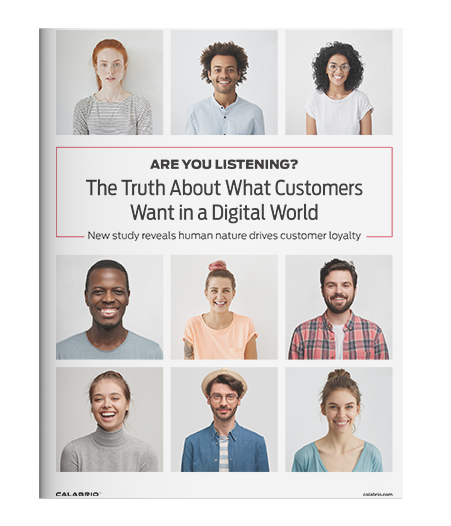 The Truth About What Customers Want in a Digital World, learn from 3,000 consumers in the U.K. and U.S. about the customer experience and what motivates customer loyalty. You’ll also learn how to turn every interaction into data you can use to learn about customer wants and needs quickly, gather the insights you need to solve problems and take direct customer feedback to every department across the organisation.